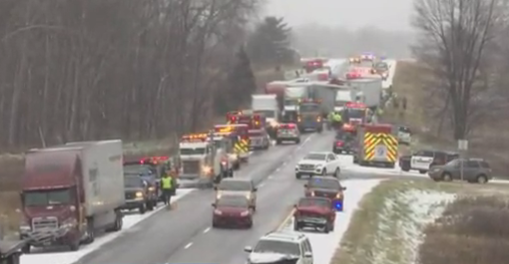 FOWLERVILLE, Mich. -- Officials say three people are dead after a series of accidents along I-96 in this area near Lansing, Michigan, CBS affiliate WLNS reports. They say slick roads and white out conditions are to blame for the chain-reaction accident. The three people, who were in two vehicles, were pronounced dead at the scene. Authorities have not publicly identified the victims or described their gender, age, or any other details about them. They say it will likely be tomorrow before they release the identities of the victims. The pileup forced the closure of the highway in both directions. It was the worst in a string of accidents that have led to road and exit closures in mid-Michigan, CBS Lansing affiliate WLNS reported. Police are warning people to give themselves extra time to travel if they’re planning to use the roads due to poor conditions. Forecasters say cold air that’s moved into the region is boosting conditions for lake-effect snow Thursday. Mid-Michigan is expected to get a few inches and southeastern Michigan, including the Detroit area, could get an inch or less depending on the location.